Have you ever imagined being the daughter of the richest man in the world? We all might have thought that in some part of our life, but there are a few people who actually live such a lavish life. Jennifer Katharine Gates is also the child of the richest man alive. Her surname is enough to make you guess whose daughter she is. If you are still confused, let us tell you that Jennifer is the daughter of Bill Gates. Being the daughter of a $95.7 billion man, Jennifer is not a spoiled child as she is a professional horse rider. Her net worth is $20 million at such a young age of 22. We all agree that Jennifer is one hell of a lucky girl. Her lifestyle is beyond what we can imagine of. It makes all of us jealous. Let’s find out more about her lifestyle and affair. The daughter of Bill Gates, one of the richest guys in the whole world, Jennifer Katherine Gates has an estimated net worth of around $20 million. At just the age of 22 years' old, she has such a huge amount of net worth. Let's look at her houses, yachts, and expensive vacations. Jennifer lives in a gorgeous mansion in 3155 Mallet Hill Court, Florida. The house was bought by her father in 2013 for $8.7 million. Happy Father’s Day, @thisisbillgates -infinitely grateful for your wisdom, love, and support! It is a 12,864 sq. feet mansion which stands tall in 4.5 acres of land. The area was bought through a trust managed by his attorney William McCaughan, who is a worker of the K&L Gates foundation. Bill Gates also bought another four-acre land at 3060 Mallet Hill Court. The house was made up of a 7,000 square foot area with Spanish style. Gates bought this house for $13.5 million. The most intriguing thing about this place is that it has got a horse barn and you all know how much his daughter Jennifer loves horses as she is an equestrian horse rider. Apart from the yacht, the lady's family also has a number of rides other people die for. Gates' family has a number of jets under their name, a Bombardier BD-700 and a Falcon 7X. The billionaire’s daughter is very active on her Instagram. If you have ever been through her profile, we bet that her travel and vacation photos with her family and boyfriend made you jealous than ever. It’s really hard for us to guess the countries (the exquisite ones) where Jennifer hasn’t been too. From skyscrapers to beaches, from mountains to oceans, from hills to palm trees, she has seen it all. For a recent vacation, the Gates family went somewhere filled with adventure and nature games. Looking at the photos it seems that the family had activities like archery, horse walks, and some sort of bungee jumping. Jennifer’s real passion is horse riding, as we already know. Her father helped her to turn her passion into her lifestyle as he bought her horse estates. 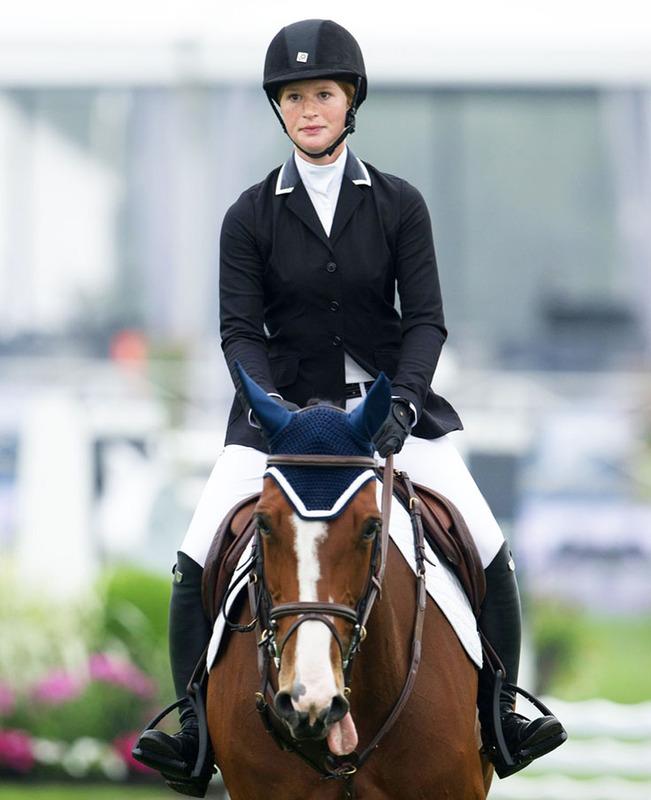 Jennifer is a professional horse rider who has competed in differed equestrian tournaments. Also Read: Rachael Leigh Cook mistaken for Bill Gates's daughter Jennifer Katharine Gates. For a fact, Jennifer started to ride horses since the age of 6 and since then she has been acquainted with horses. According to an interview in 2016, she told the Sidelines that she is the only member of the Gates family to compete. All other members of her family love to be around her horses and also ride it occasionally for pleasure during vacations. It’s not just about the horses, Jennifer is an animal lover. She owns a lot of pets among which a brown Bloodhound named Chopper seems to be her favorite. Have a look at one of her dogs! Bill Gates’ daughter Jennifer Katherine Gates isn’t married yet, thus she doesn’t have a husband or any children but she is in a dating relationship with someone. The lucky guy’s name is Nayel Nassar who is also a horse rider too. Her boyfriend Nayel is an Egyptian by nationality. Jennifer and Nayel’s Instagram is filled with each other’s romantic pictures. According to some sources, horse riding brought them together, but it is still not unknown about how much truth this news holds. This is what the billionaire’s daughter having a personal net worth $20 million’s life looks like in short. We hope we’ll get to see Gates’ daughter tie the knot with her boyfriend real soon.